Well this is a shockingly delayed review, but when you own 732 books it can sometimes take a while to use one (before you judge me too harshly, know that I also read and peruse my cookbooks like novels). This cookbook was on my mind when we got back from the Disney cruise precisely because I will always associate the Ghirardelli Soda Fountain and Chocolate Shop with Disney World (although I have visited the San Francisco one also). I realize that sounds a little crazy, but our hotel (way back in February 2011) was right across the street from Downtown Disney, so while John was at his conference, the girls and I spent a lot of time exploring (the free) Downtown Disney. And often after visiting the actual parks, we would still head over to the Ghirardelli soda fountain for a late night hot chocolate. So in this weird way, The Ghirardelli Chocolate Cookbook: Recipes and History from America’s Premier Chocolate Maker was the perfect souvenir for me from our trip to Disney World. And with Disney on the brain, when Alex and I recently decided we were going to add Valentine’s Day colored M&Ms to some cookies, I gave her the Ghirardelli cookbook to browse through. It is a smaller cookbook, hardback with a little over 80 recipes that are mostly classic chocolate desserts–cookies, brownies, bars, cakes, pies, tarts and even some candies. There are many pictures, but not for every single recipe. 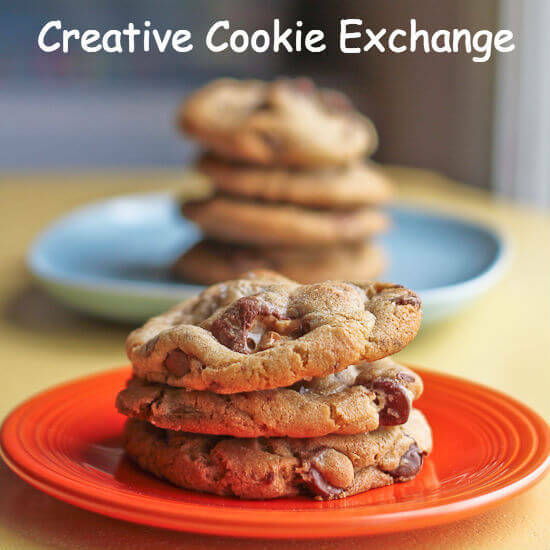 We had been craving chewy drop cookies and Alex loves oatmeal, which made the decision easy. The Oatmeal Chocolate Chip Cookies were fairly typical, but heavier on oats and lighter on flour than a lot of recipes I have tried. 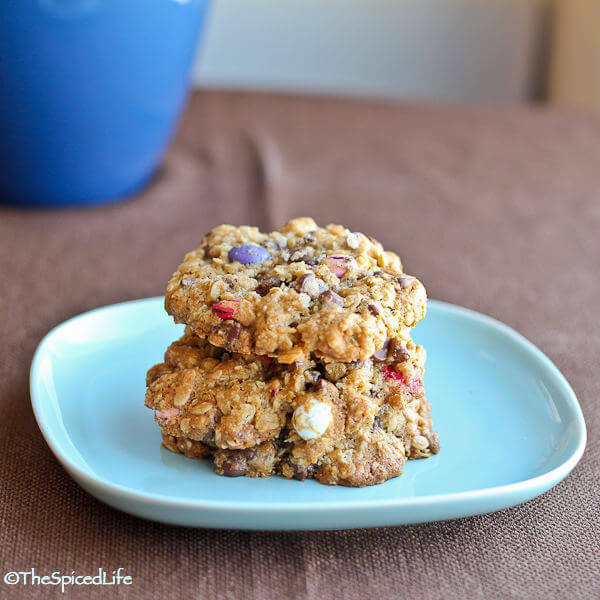 Because we were using Bob’s Red Mill Organic Oats Rolled Thick, this meant the recipe definitely benefited from resting overnight and giving those thick rolled oats time to absorb some of the moisture in the cookies. 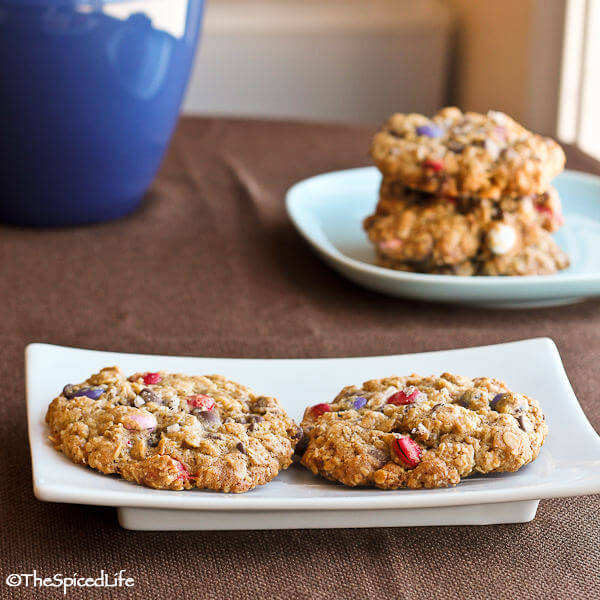 The recipe was also quite heavy on the chocolate–not shocking in a chocolate cookbook, and we added even more in the form of M&Ms. So I recommend decreasing or even eliminating the chocolate chips if you are the kind of person who likes more cookie and less chip (and yes these people do exist–my sister is one of them!). My main change was to remove the nuts, and add Dark Chocolate M&M’s Valentine’s Candies. However, I also had egg yolks sitting in the fridge, so I doubled the recipe (which as written called for one egg) and substituted 2 egg yolks for 1 of the eggs (I did not want to remove the egg white completely from the recipe). I also removed the cinnamon and nutmeg because I am not such a fan of those spices with chocolate. I also added the vanilla salt on top of the cookies because I love salt and chocolate so much! We were very happy with how the recipe came out and we are also very happy that half the recipe is frozen in balls waiting to be spontaneously baked when the cookie craving strikes! The recipe as written below is how I made the cookies. Closely adapted from The Ghirardelli Chocolate Cookbook; this recipe makes a lot--I suggest baking half and freezing the other half. Whisk together the flour, salt and baking soda. Set aside. Measure out the oats and set those aside too. Beat the butter until creamy. Add the sugars and beat until fluffy. Scrape the sides and bottom of the bowl. Add the egg and egg yolks one at a time, beating to incorporate after each addition. Scrape the bowl as needed. Beat in the vanilla. Add the flour mixture on the lowest speed (or mix gently). Mix in the oats on the lowest speed also. Be sure to keep scraping the sides and bottom of the bowl as needed! Then mix in the chocolate chips and M&Ms. Cover the dough with plastic wrap and let chill for at least 1 hour (the dough will last in the fridge for 3 days; I got the best results after at least waiting overnight). When you are ready to bake, preheat the oven to 350 F. Line a baking sheet with parchment paper or a silicone mat. I used a heaping tablespoon for the pictures I took because hefty cookies are the most attractive. But the majority of my cookies I made with heaping teaspoons for portion control. Small and large both work equally well. Make sure the balls of dough have at least 2 inches around them for better air circulation in the oven. Sprinkle the balls of cookie dough with the vanilla sea salt. Bake for 9-15 minutes, depending on the size of the cookie. Just keep an eye on them–the finished cookie will be golden at the edges but still a bit soft in the center. 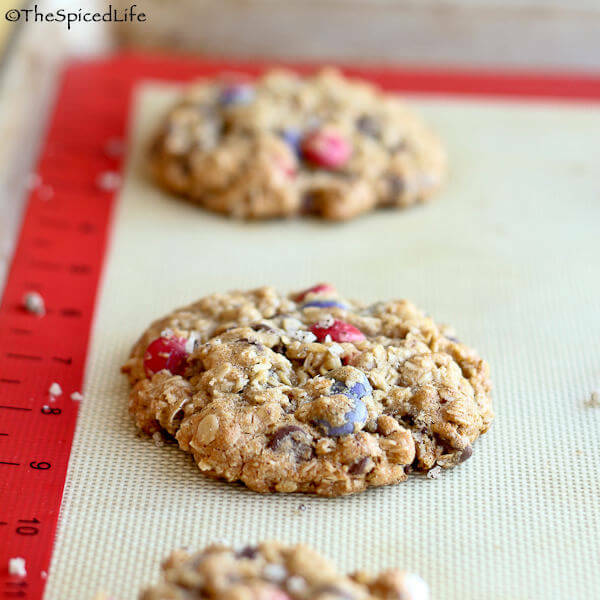 Let the cookies cool for 5 minutes on the cookie sheet before transferring them to a cooling rack. Stored in an airtight container the cookies will last at least 2 days–they never made it past that point in my house. As always, Amazon affiliate links were used in this post, but only to link to items I would be discussing and linking to anyway. San Francisco always makes me think of Ghirardelli…one of my favorite chocolates! 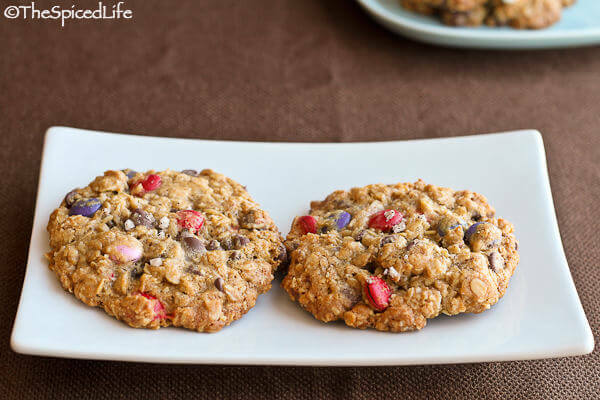 I love a little bit of oatmeal in my cookie and along with my chocolate so these sound awesome! I have some mint M&Ms leftover from Christmas sitting here so they might have to make an appearance in lieu of the valentine’s ones. yum. this is pretty much an unbeatable cookie combination, and the use of ghirardellli makes it even more outstanding! I absolutely love these cookies. The recipe maken so much batter, I always put 3/4 in the freezer in 3 portions. Last week I used up my last batch and my boyfriend took the cookies when he went to hang out with some friends. I got an whatsapp from one of them it read: a-ma-zing cookies!